Welcome Home to 1074 MATTAWA LN in award winning Maple Leaf Golf & Country Club. 1983 double-wide manufactured home located on an over-sized 5716 sq ft corner lot. Interior floor plan includes kitchen dining room living room guest bedroom guest bathroom with tub/shower combination master bedroom master bath with walk-in shower. Laminate floors in living room and dining room ceramic tile floors in kitchen carpet in bedrooms. Beautiful color palette throughout. 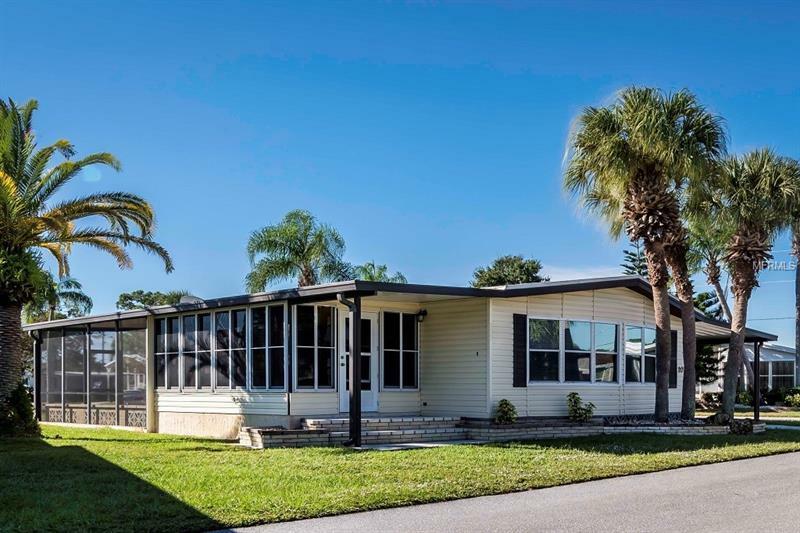 Exterior includes 209sq ft screened rear porch 176sq ft enclosed lanai with windows/screen which offers you an extension to your living space. Spacious storage shed in carport with laundry. Covered parking. Located in a resident owned 55+ gated golf course community with an active resort lifestyle. Features 75+ clubs/activities including a Par 62 golf course 5 tennis courts bocce ball lawn bowling 2 shuffleboard courts 4 heated swimming pools 2 hot tubs fitness facility woodworking facility 2 pickleball courts restaurant with full service bar and much more. Home prices INCLUDE $40000 membership certificate/share. Monthly HOA fee of $256 per month increasing $12 in January 2019. One indoor cat permitted no dog. Sold furnished and equipped WITH golf cart. Pet Restrictions: One indoor cat only, NO Dog.